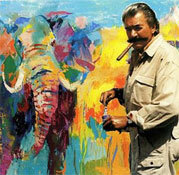 NeimansOnly.com specializes in buying and selling ORIGINAL LeRoy Neiman artwork. Mint condition Neiman ORIGINALS, we guarantee it. We have access to almost every single LeRoy Neiman he ever did! name of print and are you buying or selling? What a fabulous website to come to if you want to purchase a LeRoy Neiman Original or a LeRoy Neiman Serigraph. Our goal is to beat any other gallery or website price ever! We guarantee that your piece will be authentic, in mint condition and will be delivered on time! What other website can you go to and talk to the owner Gigi, direct, she has been in the Fine Art business 33 years! LeRoy Neiman whose work has been shown from galleries to museums was born in St. Paul, Minnesota. His name is sometimes mispelled as Leroy Nieman, however, the proper spelling is LeRoy Neiman. Mr. Neiman studied at the Art Institute of Chicago, the De Paul University and the U. of Illinois. Later, he taught at the Art Institute of Chicago's school for 10 years. It was when LeRoy Neiman moved to New York City back in 1963 where he had his first solo show. Ever since, LeRoy Neiman's original artwork became known and popular as colorful portrayals of sports figures, various sports, portraits, animals and the people and events of the moment. Through the years he became best known for the sports genre and his work for the Olympics of '72, '76 and 1980 respectively. LeRoy Neiman is greatly missed however he certainly lives on in the vibrant, beautiful art pieces he left this world with.